A view from the base of a church bell tower. Standing at the base of tall buildings always inspires awe in me. To look so high up and to know that people were involved in crafting and putting the finishing touches to such buildings is still something I admire as an adult. 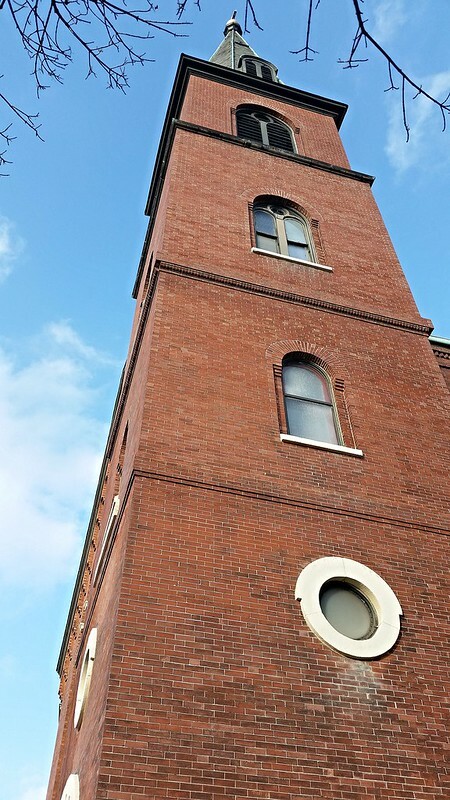 With this church tower, of course, it comes with the idea that the height is also an attempt to reach (or direct messages towards) the heavens. I was also struck by this tower in terms of its windows for each level from the porthole window on the first floor to the single on the second floor and the double windows on the third. The fourth and fifth-floor shifts from glass windows (at least in appearance-there may be glass inside) to the shutters and I can only assume that is because they do not want to silence the church bell. Also in this photo, I thought about taking the photo without the branches, but I found they added something to the photo. This could be the idea that it is so tall that I cannot get a clear shot because of the surrounding trees or that the trees in horror-movie fashion are creeping out toward the church.